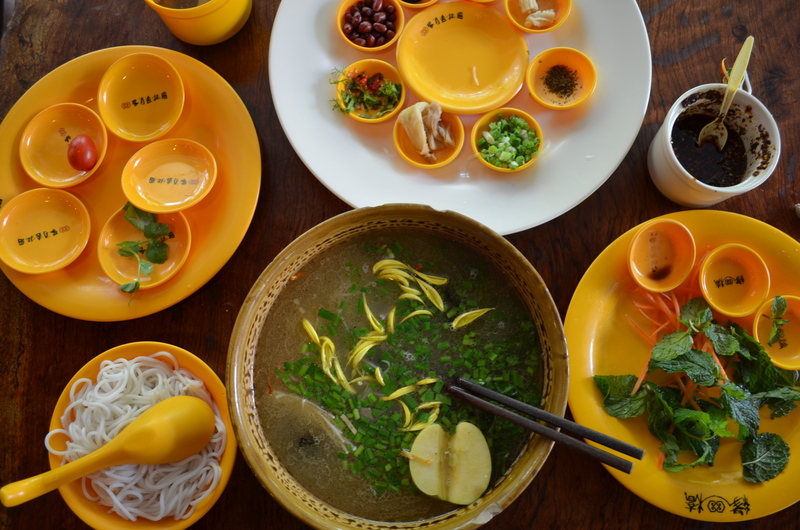 After wandering around town in the afternoon heat, I stopped into a noodle shop called Mengzi Bridge-Crossing Noodle Shop to fill up on another of Yunnan’s most famous bowl. At Mengzi, the specialty involved chrysanthemum flowers, so I was very intrigued considering how much I love chrysanthemum tea. Granted, fresh flowers add different elements than the dried ones used for tea, but I also liked fresh flowers, particularly squash blossoms, so this was a win-win situation. 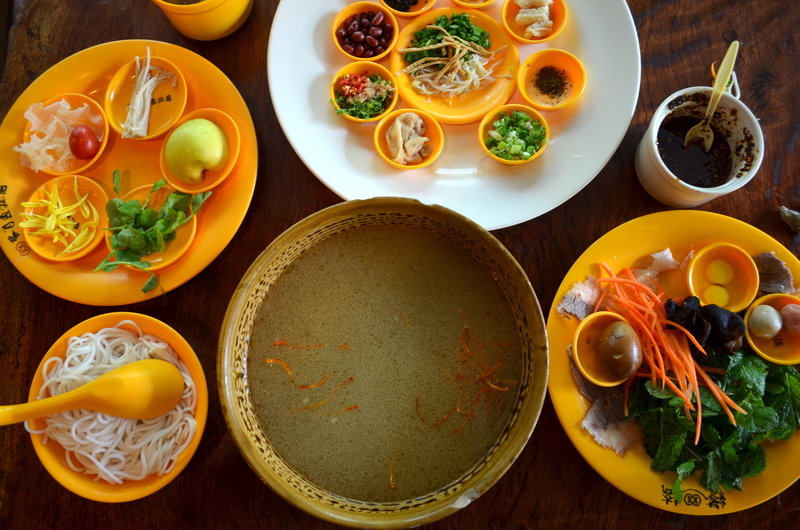 A similar set-up as Jian Xin Yuan in Kunming arrived: a plethora of small plates with ingredients to add to a steaming bowl of soup. This soup was a more level base of rich chicken soup, not piqued with that gamey punch I had at Jian Xin Yuan and probably with a reasonable amount of chicken bouillon powder, but it was also cheaper, and scrumptious just the same. 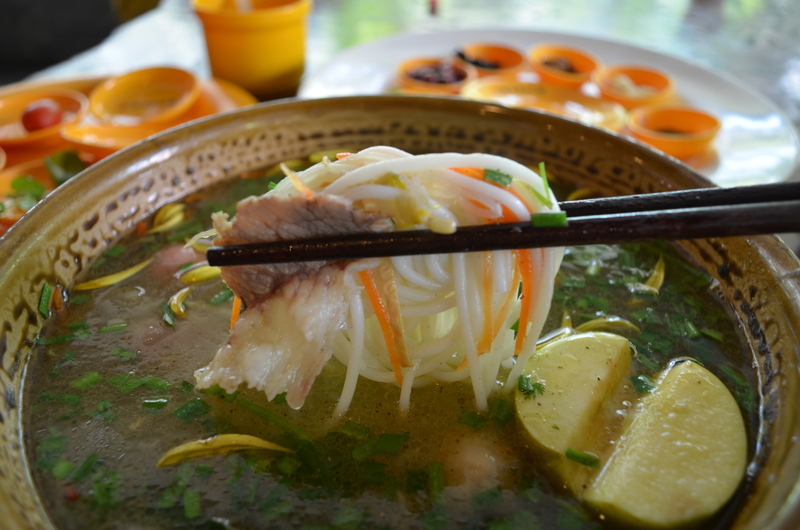 For me, the soup wasn’t so much for drinking as a salty quarry of flavors, coaxed out of slices of ham and fish and herbs and (hopefully) transferred to the plain rice noodles. The most interesting ingredient was a hearty half of an apple, which I consequently threw into the soup as well. The result was quite delicious, a salty-sweet flavor with crunch, body, and just enough sourness and acidity. The chrysanthemum petals didn’t really have the same fragrance either in aroma or taste that its tea-ready counterpart, but I had enough distractions to only mildly notice. On my second bowl, I began to like even more the concept of bridge crossing noodles, in part because of the diversity of ingredients, and experiencing how each interacts with and develops in the salty heat of the broth, how each contributes to the texture and flavor of bites. Each serving is a diaspora of color and aroma, and with some experience, you can really tailor each bowl as you like, so long as you enjoy the soup base.